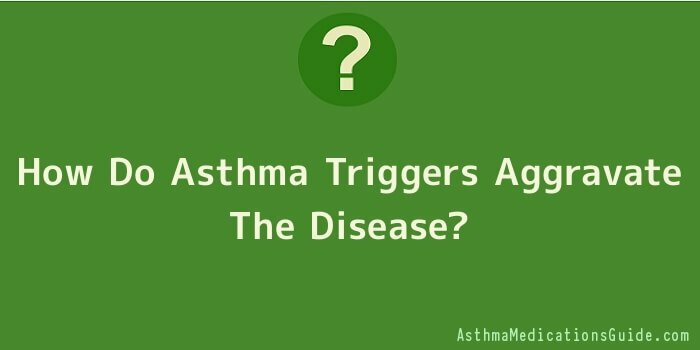 How Do Asthma Triggers Aggravate The Disease? Asthma is a disease that is caused by the dysfunction of the lungs and the airway. In a normal person, when one inhales any irritant, the airway constricts to prevent it from going any further. After a brief moment, it relaxes and expels it. In this way it gets rid the irritant without much trouble. In an asthmatic person, the reaction would be very different. The airway constricts here also, as a direct reaction to the irritant. However, after that, instead of relaxing and expelling the irritant that troubles the airway, it will further constrict cutting the air and causing breathlessness. At this time, the immediate use of an inhaler or nebulizer can again relax the airway, allowing the asthma patient to breathe easy again. As explained above, an attack of asthma has to be triggered by an irritant. This irritant can be anything – cold, exercise, sudden fright, sudden emotion, pollen, dust, animal dander, dust mites, food smell, powder, cigarette smoke, mold, cockroaches, and the like. When the patient encounters any such asthma trigger, the asthma flares up and provokes an attack. Hence, it is always advisable to be very careful if you are an asthma patient and you feel that you are about to get into contact with any such asthma trigger. Prevention is always better than cure. While an attack can be pacified with the help of an inhaler or any other prescribed medicine, the best would be to avoid the attack altogether. This is possible only when you would be very attentive regarding your surroundings and try to keep away as much as possible from any asthma triggers present in your environment. The patient should make his or her home totally dust free as this is one of the major asthma triggers known. There are dust proof mattresses and pillows as well as dust proof covers available which can be very beneficial. The home should be cleaned as much as possible every day so that dust is not accumulated in the house. An asthmatic person should not keep any pets – especially dogs, cats or birds since these may cause allergy with their hair, feathers, etc. Asthmatic patients should not smoke or stay in the company of people smoking around them. As long as they take care to stay away from any asthma trigger, the asthmatic person can lead a close to normal life.